Taking the time to bring employees together can be extremely beneficial to the everyday flow of the office. Corporate team building is an important part of any business that is sometimes overlooked. The Crescent Beach Club is a unique beachfront location where employees can get to know each other out of the office and work together while alleviating workplace stress. Staff turnover is one of the many consequences of unhappy workers. Employees who don’t feel appreciated do not give 100% to their job. At the end of the day this lowers business productivity. Corporate team building brings people together, allows for enhanced workplace creativity, and helps to create a more collaborative work environment. Companies who experience collaborative work environments are five times more likely to be high performing. Team building exercises can help demonstrate how to leverage each other’s strengths and weaknesses by pairing staff up in a way that compliments their skills and maximizes efficiency. Taking a day to spend group time with employees will help remind them that the work they do everyday is meaningful. A little fun with the office staff can help eliminate personal and political barriers that may exist in the workplace. It creates an environment of growth, engagement, and a general, long-term commitment to the organization. In the end, this improves productivity. Anyone can gather all their employees into a room and turn on an inspirational video. While this may seem like a simple and efficient solution to employee team building, is it really effective? Getting employees out of the office for a day of fun and beneficial team building activities, encourages team spirit, individual confidence, communication, collaboration, and even some friendly competition – for bragging rights in the break room. If you want your corporate team building event to effect real change in your company, finding the right venue to host your event is the key ingredient. Located only 45 minutes outside of New York City, The Crescent Beach Club allows employees to get away from the hectic office life and experience a beautiful beachfront destination. The casual, tropical-inspired setting breaks down the separation between leadership and employees. This allows for your entire team to learn more about each other vs. being packed into a tight, stuffy conference room. 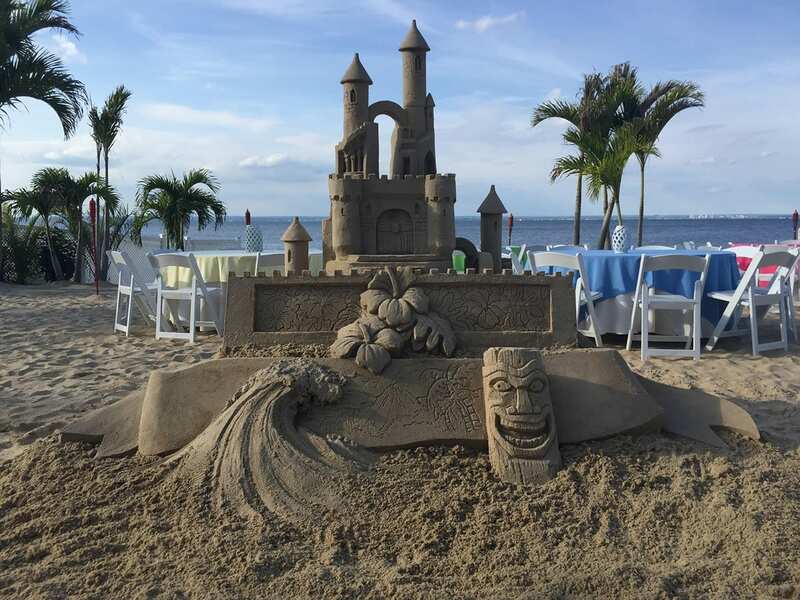 The environment at The Crescent Beach Club is perfect to accommodate different corporate team building activities like sand castle competitions, scavenger hunts, an abundance of sports, or just a day of relaxation. Do your employees need to work on synergy? The Crescent Beach Club’s “Survivor” exercise would be perfect for your corporate team building event. Based on the well-known TV program, the “Survivor” team building exercise forces each team to use their quick wit and creativity to survive the elements. Each group builds a raft out of miscellaneous objects like tires, bamboo, rubber bands and wood, and then races around a buoy in the water. The goal is to work together to get your team’s raft back to the shore first. Or maybe you just want to reward your employees for their hard work and dedication. The Crescent Beach Club has an exercise for that too. The “Chillaxing” exercise is anything but a workout. Your team will enjoy a relaxing day of sun bathing, massages, and yoga at this private beachfront destination. If these exercises aren’t enticing enough, each corporate team building day starts with a delicious breakfast and includes a late lunch. After discussing all the takeaways from the day, everyone enjoys a late afternoon snack or drink. Altogether this day of fun and relaxation helps forge friendships in the workplace, motivates people to come to work, and enhances workplace productivity. No matter what corporate team building exercise you choose, every corporate event at The Crescent Beach Club ends with some quality time watching their famous beach sunset. After realizing the positive impact of your corporate team building day, you’ll want to turn this event into an annual activity for years to come.